With WhatsApp Messenger’s newest update, you can finally text while driving and that too without looking at your smartphone screen. The only catch is that you need to have Apple CarPlay infotainment system installed in your four-wheeler. So, let’s check out how exactly can this update come in handy for you. The latest WhatsApp update, version 2.18.20, has brought the CarPlay integration in tow. Several users have reported that they’re seeing the messaging app’s icon appear on their CarPlay dash screen when the iPhone is connected to the same. This means WhatsApp’s now offering an in-car experience which builds on the existing SiriKit integration of the app. Previously, you could only access WhatsApp to send messages via the Siri integration but the latest update now brings a plethora of features for the messaging app to your vehicle. 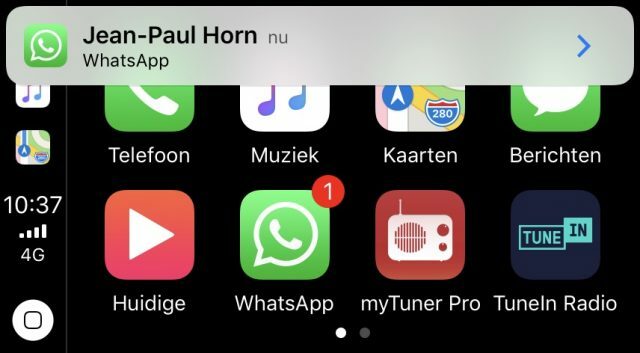 The biggest change that you’ll notice after this update is that the CarPlay interface will now display native push notifications for all new incoming messages. They’ll look quite similar to the heads-up notifications you see on the iPhone, but you cannot browse through a list of conversation or read them on the CarPlay screen. Siri is also going to indicate the number of unread messages you’ve received and read all of them out loud, so you don’t have to reach out to your iPhone. While this is definitely a handy feature, you can also reach out to the in-dash screen and tap the WhatsApp icon to dictate your replies to Siri. Yeah, you’ll still have to rely on Siri to send out messages to your contacts, whom you can pick from the icon on the CarPlay dash screen. You’ll then have to blurt out the messages and Siri will ask you for confirmation before sending it. It is possible for you to change the text or just go ahead and sent the WhatsApp message. Apple’s CarPlay growth has been quite stunted over the past few years. WhatsApp, if you come to think of it, is one of the few high-profile companies to have made their messaging platform compatible with CarPlay. This is a welcome addition to WhatsApp, which is widely used by close to 1.2 billion users across the globe every month. So, had you been waiting for this integration forever? Let us know your thoughts in the comments below.